Inlaws & Outlaws will be showing at South Seattle Community College on Thursday, May 29th, 2008 in Olympic Hall Room 206. 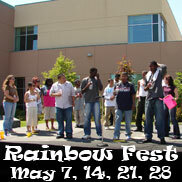 The screening closes out the school's Rainbow Fest, and is sponsored by the SCCC GSA and the student commissioner. Director Drew Emery will be in attendance for a Q&A after the film. Olympic hall is the building circled in the map below. Click for Parking information.